Removing black mold isn’t just about maintaining your home, it’s about ensuring healthy indoor air quality and keeping yourself and your loved ones safe. Black mold problems that are not addressed immediately can quickly spread to and contaminate other areas of your home, compromising its structural integrity and safety. Once you know that you have black mold in your home or office, it is crucial to remove it as soon as possible. Never attempt to clean black mold yourself, as this could result in further contamination and put you at an unnecessary risk of exposure. 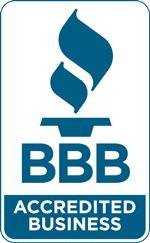 Contact Mold Busters today — we’re certified black mold removal specialists with 15 years of industry experience. Black mold, scientifically referred to as Stachybotrys atra or Stachybotrys chartarum, is without a doubt, one of the most dangerous types of mold that can be found in our homes. Due to its toxic nature, it has been linked to severe illness, respiratory disease, neurological damage as well as many other incapacitating conditions. For these reasons, and many others, it is critical to educate yourself about black mold and to remove it as soon as you discover a problem. Once black mold starts to grow, it can spread very quickly to cover entire walls, floors and ceilings. Black mold is common in buildings that have experienced serious water damage or flooding. It can be equally destructive in both new and old constructions, leading to compromised structural soundness, a decline in indoor air quality, Sick Building Syndrome and other serious health problems. In fact, industry professionals often refer to black mold as the invisible killer or silent killer because people usually have no clue that they have a black mold problem until they start to experience severe, persistent and debilitating symptoms. It’s not always easy, or even possible, to tell if a building is contaminated with black mold. In fact, airborne mold spores are so tiny that you don’t even know they’re there, often hiding in tight or inaccessible spaces such as behind walls, underneath flooring, and in attics. When black mold growth is suspected in areas that are difficult to reach during a basic visual inspection, the use of technology, such as high-resolution infrared cameras and powerful air sampling pumps, is required to detect black mold. Professional mold inspections are also necessary to identify and confirm the species of mold present because not all black discoloration is caused by black mold. Discolored walls: Discoloration of walls and other surfaces like ceilings and floors is a big tell of a mold problem. Yellow water stains on walls are often succeeded by black mold spots. Cracked or peeling paint, and bulging or bubbling wallpaper are signs that there is moisture in your walls. But before you jump to conclusions, you should contact a professional to conduct a mold test in order to confirm that it is, in fact, black mold you’re dealing with. 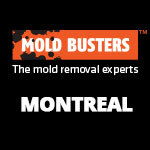 Musty odours: That stale, musty odour, typical in basements, is an obvious sign of mold growth. Once you notice there’s a musty odour coming from your home (most likely from a recently wet or damp surface), keep your eyes open for other indicators of mold. Damp boxes in your basement or garage, crystalline substances on basement walls, and tiny blotches on your water softener tanks are a few possible indicators of mold in the home. Health symptoms: Watch for unusual or recurring symptoms such as coughing, sneezing, rashes, eye irritation or other allergy-like reactions. Ask yourself if anyone in your house has become hypersensitive to changes in environmental conditions. Are your children suffering from respiratory problems and experiencing allergic reactions when they’re inside the house? If so, you may be breathing in air contaminated with black mold spores. Poor ventilation (high relative humidity, condensation on windows and walls, etc. ): Most modern homes are so air tight and poorly ventilated that they suffer from high humidity and increased concentrations of indoor contaminants like dust, bacteria and black mold. Poor ventilation also results in moisture (condensation) accumulating on ceilings, walls and other surfaces. And due to a lack of airflow, these wet areas take more time to dry, giving black mold the perfect opportunity to grow and multiply. To ensure existing black mold problems are detected before they wreak havoc on your home and your health, frequently check for these common signs of mold. 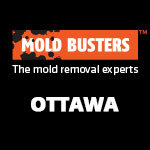 Also, if you’re located in Ottawa, Montreal or surrounding area, consider consulting with one of our certified mold inspectors. Explain signs you’re noticing. Inspectors cannot conclude anything over the phone, but they may have a better idea of what you’re seeing, smelling or experiencing and whether it has anything to do with mold. What causes black mold to grow in a house? Flooding: In the unfortunate event of a flood, water ends up soaking entire surfaces. Nothing is spared, not walls, ceilings, or flooring. Without your intervention, it could take several weeks for these materials to dry naturally. This is how many black mold problems start. Irregular maintenance: For one reason or another, many homeowners do not stick to a regular maintenance routine for their homes. Common areas such as windows, HVAC systems, and plumbing need to be regularly cared for and inspected for signs of moisture and mold contamination. Humidifiers: Humidifiers are great for adding moisture to dry air, but they are also perfect hosts for the growth and distribution of black mold throughout the house. This problem can be taken care of easily by cleaning the humidifier unit with an anti-microbial, anti-fungal solution and using a humidity sensor to control humidity levels. Condensation: Condensation frequently occurs on pipes, in air conditioners and on walls (especially in attics and basements), providing all the elements necessary for mold growth. Backed-up gutters: Blocked gutters stop the flow of rain water, thereby causing this water to eventually overflow and seep through the walls or roof of your home. If the problem is not found and fixed early, it can lead to severe mold growth. What’s worse, this mold growth is happening behind the finished walls of your home, where you can’t even see it. Damp clothes: Some people dry their clothes indoors. Others sometimes leave damp clothes in their laundry baskets. If this is you, you could be inadvertently raising humidity levels in your home and setting yourself up for a black mold problem, not to mention persistent musty odours. Humid basements: Because basements tend to be poorly ventilated, they contain higher amounts of moisture and humidity compared to the others rooms in the house (explaining the musty damp smell we so often notice in basements). Combined with the fact that homeowners don’t inspect their basements too often for condensation or leaks, black mold has the perfect opportunity to grow. Water buildup around the foundation: Water can build up in your yard and/or in the area around your home’s foundation. By now we all know that this moisture will ultimately lead to black mold growth; but what homeowners don’t always realize is that this can also cause structural issues with their property. The problem is further amplified if the ground around the home is not sloping away from the foundation, which can cause groundwater to be directed and pooled around the foundation. A possible solution is to dig a drain to divert groundwater away from your home. 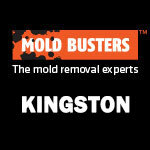 Professional black mold removal is effective and yields long-lasting results. 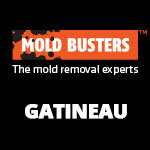 Call Mold Busters today for expert help with your mold remediation project. Mold is most likely to grow in areas where moisture levels are high. This is due, in part, to the activities that go on inside these rooms, such as showering in the bathroom and cooking in the kitchen. Black mold, or Stachybotrys chartarum, is the deadliest and most dangerous species of mold, as well as the one that should be avoided at all costs. 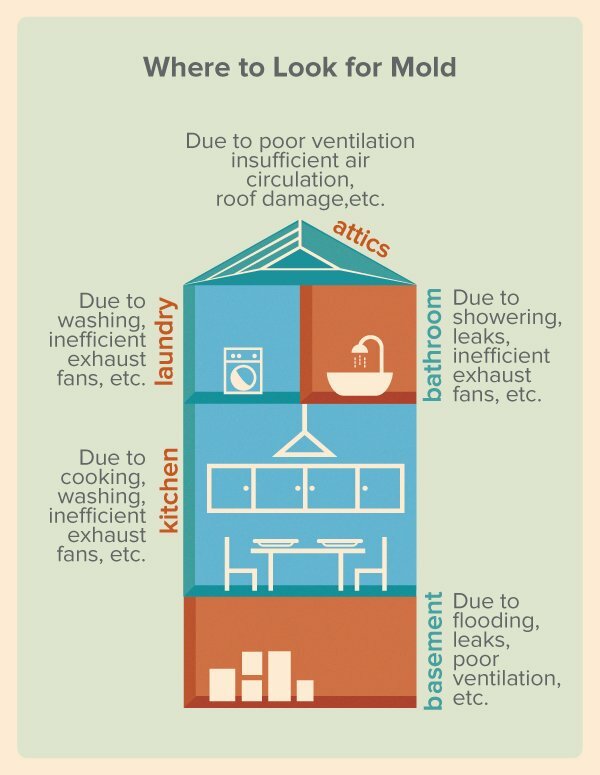 See our complete list of health effects and symptoms caused by black mold. If you suspect mold, do your research: be able to recognize the first signs of a mold problem and know when an air quality test or surface sample for mold is necessary. Only a mold test can confirm the presence of mold for certain; therefore, if there’s any doubt, get your property tested. If the results are positive for mold contamination, it is important to proceed with remediation. Acting fast is a must with black mold–if you don’t, the problem will only get worse, threatening your health and safety. When it comes to black mold, don’t take any risks by trying to get rid of it yourself. There are many bloggers and DIY enthusiasts out there who say that applying a mixture of bleach and water on a moldy surface will kill the mold. However, this is not true. This could actually make the problem worse. For one, the method you use to clean mold depends on the type of material that is contaminated. Hard, non-porous surfaces like ceramic and glass may be easily cleaned with a damp cloth. Meanwhile porous materials such as wood, carpets or drywall cannot because the mold spores have likely spread below the surface. These materials absorb the mold contamination deep down, so removing mold becomes much more difficult. Often, if the damage is severe, you may even be required to cut out entire sections of contaminated drywall, for example, and replace them with brand new gypsum board. For these types of black mold problems, hiring a remediation professional is your best and safest option. 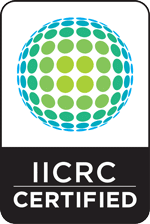 You can trust the IICRC-certified experts at Mold Busters to give you fast and effective results with long-lasting protection against future mold growth. We even provide an air quality test after the mold remediation to make sure that the black mold has been completely eliminated from your living environment. Systematic black mold remediation services play a huge role in improving your quality of life and protecting you from disease, not to mention keeping your property intact. In addition, these services are the only reliable way to prevent costly mold-related damage and loss. Although the idea of removing mold on your own may seem cheap, easy and appealing, the use of improper cleaning techniques can leave you with a bigger problem than you had to begin with. When done incorrectly, do-it-yourself mold removal can cause mold spores to become airborne and spread to other areas of the home, where they can be easily inhaled by the home’s occupants. By hiring a professional mold removal company, you can eliminate mold, protect your family and gain peace of mind knowing that you’re living in a safe, healthy environment. Recurring black mold problems need to be dealt with by professionals who are able to remove mold safely and efficiently. When this is done, you and your family can return to your everyday, mold-free lives.